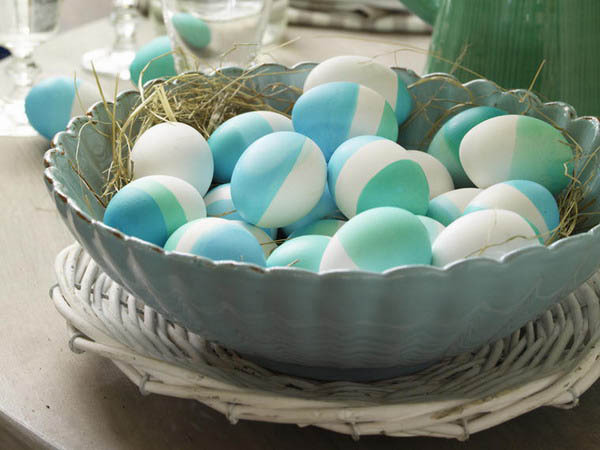 There are many ways to dye Easter eggs and create colorful and unusual, artistic or simple Easter eggs for spring holiday table decoration. Easter eggs are special eggs that are meaningful and symbolic table decorations, food and gifts that are often given to celebrate Easter. Easter Eggs decorating is the oldest tradition. 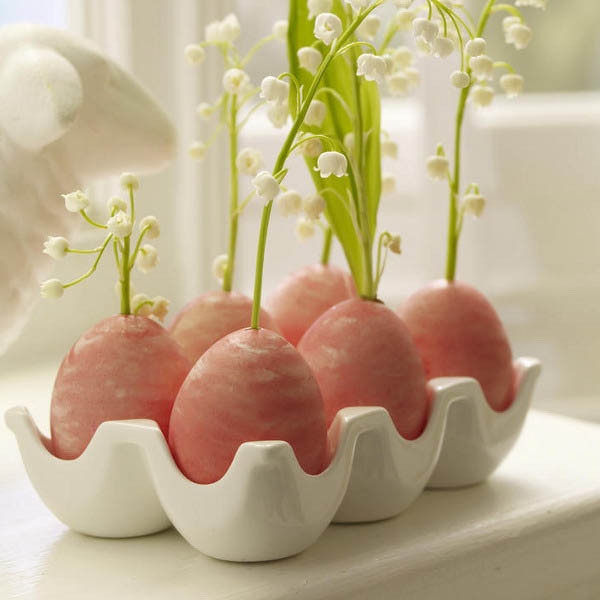 Dyed or painted chicken eggs look bright and cheerful, creating optimistic and festive table decoration. Modern custom is to use chocolate eggs or plastic Easter eggs decorations filled with confectionery such as jelly beans, but dyed chicken eggs is a way to keep ancient traditions alive. 1. A quick way to dye Easter eggs in yellow and brown colors is using onion husks. 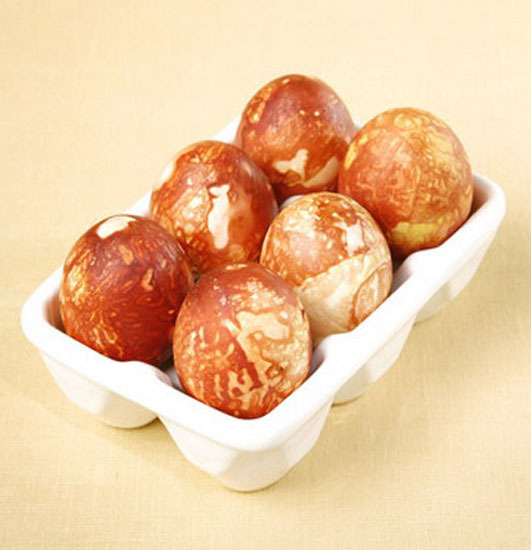 Easter eggs decorating with onion husk create uneven pattern in golden yellow to reddish-brown color shades. The color depends on the amount and type of onion husk. 2. Food colors can be used for Easter eggs decoration also. 3. Natural food is great for Easter eggs decorating. Add a teaspoon of vinegar to water. Boil eggs 15 minutes with natural coloring additives. Light red dye is created with beets or blueberries. Onion husk produces orange and brown colors. Oranges or lemons and carrots give yellow and orange colors. Turmeric roots and walnut shells are yellow dyes. Spinach leaves, and green apples are green dyes. Blue Easter eggs can be created with red cabbage leaves. Coffee adds beige and light brown color tones to eggs shells. If you leave eggs in the refrigerator overnight, the color will be brighter. 4. Speckled Easter eggs can be designed with rice. 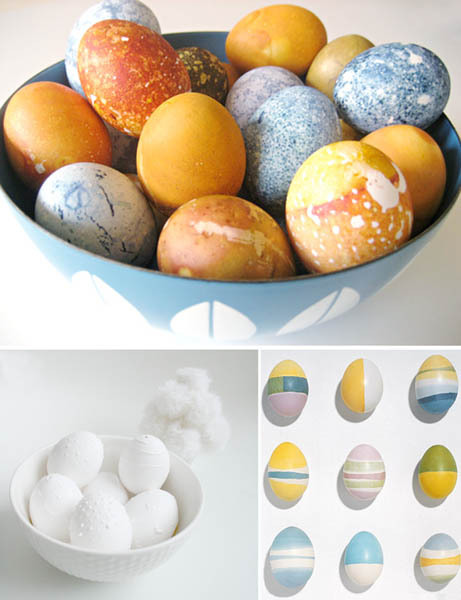 Roll wet eggs in dry rice, wrap them in cheesecloth, tie ends and boil in water with your favorite Easter eggs dye. 5. Coloring marbled Easter eggs is simple and easy. 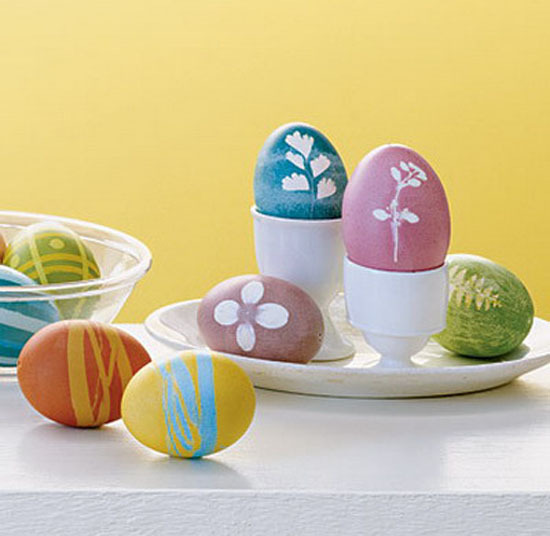 Use threads for these beautiful and creative Easter eggs decoration ideas. 6. Adding leaf design is one of the most spectacular ways of Easter eggs decorating. You can use interesting small leaves in different shapes and sizes, such as herbs leaves. Attach them to the eggs, wrap and tie tightly to keep leaves on places. Leaf patterns are beautiful nature inspired and symbolic Easter eggs decoration ideas that create amazing designs for spring holiday table.